This is a follow up to last week's brouhaha about the Federal Reserve discontinuing the publication of the broadest measure of the money supply, the M3 data series. Instead of trying to come up with something clever on a subject in which we are already in way over our heads, this post simply provides a few colorful charts and links to some other stories on this topic with minimal commentary of our own. 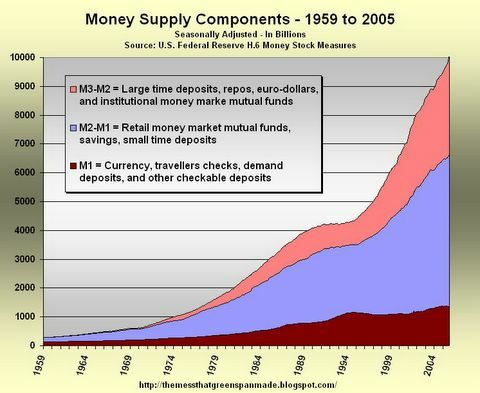 The first chart is the history of the three money supply measures since 1959. Notice the increasing percentage of M3-M2 in the total, and the decreasing percentage of M1 since the late 1970s. 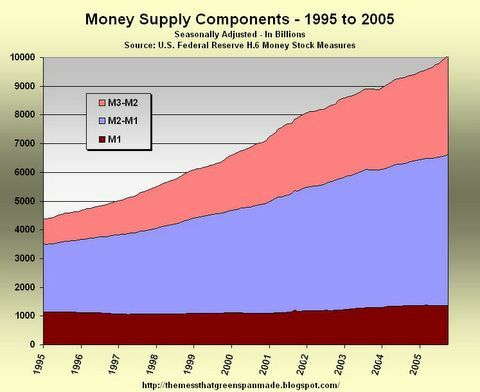 The second chart zooms in on the last ten years showing how M3, the total money supply, has gone from under five trillion dollars to over ten trillion. Here, the increasing role of M3-M2 is clear - it has gone from roughly 20 percent of the total to near 40 percent, while M2-M1 has remained fairly stable at just over 50 percent of the total, and M1 has declined from about 20 percent to near 10 percent. 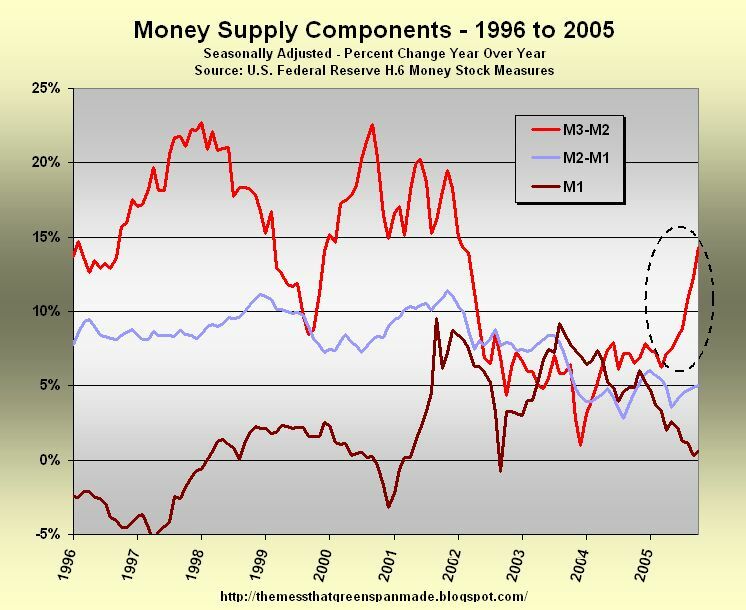 Now this chart is interesting - the year-over-year percent change to each of the money supply components. Looking at the year-over-year change over time seems to be the universally accepted way to look at data such as this - in addition to completely removing the need for seasonal adjustments, it gives a clear indication of trends that might not otherwise be noticeable. What's that circled on the right? Dunno. It looked interesting, given all the talk of conspiracy theories and such - it just looked like something that should be circled. It looked like something that should be watched over the next four months, before its reporting is discontinued. Inflation is measured by taking a "basket" of goods, and comparing the prices at two intervals, and adjusting for changes in the intrinsic basket. Thus, there are different measurements of inflation, depending on the basket of goods selected. The most common measures are of consumer inflation, producer inflation and GDP deflators, or price indexes. The last measures inflation in the entire economy. Inflation measurements sometimes exclude volatile goods from the basket to be able to gauge the "core" rate of inflation. In some contexts the word "inflation" is used to mean an increase in the money supply, which is sometimes seen as the cause of price increases. Some economists (of the Austrian school) still prefer this meaning of the term, rather than to mean the price increases themselves. Thus, for example, some observers of the 1920s in the United States refer to "inflation" even though prices of goods were not increasing at the time. This is the crux of the controversy - how "inflation" is defined and whether the increase in the money supply is a truer measure of "inflation" than are the price indices. There are many links in the post that appeared here last week - here are some newer ones or ones that were missed the first time around. To M3 or not to M3? From the point of view of a policy maker, why do we care about monetary measures in the first place? We care for the same reason everyone else does -- because most of us still believe that, ultimately inflation, inflation is everywhere and always a monetary phenomenon. To me, the transparency issue has to do with sharing information directly related to monetary policy decisions. Discontinuing collecting the M3 series would be directly counter to that if, in so doing, the Fed was withholding data from the public that were nontheless being used in policy deliberations or thinking. That is decidedly not the case here. What's going on with non-M2 components of M3? A commenter asks why I think they are discontinuing M3 (a question I did not address directly above). The truth is, of course, I don't know. As I said above, I'm pretty sure that it's not to try to hide anything, particularly anything nefarious going on with repurchase agreements. If I had to speculate, I'd say it was probably determined that the value of that particular formulation of a monetary aggregate to the Fed was no longer was worth the cost of producing it on a monthly basis and benchmarking it annually. From the point of view of a policy maker, why do we care about monetary measures in the first place? We care for the same reason everyone else does—because most of us still believe that, ultimately inflation, inflation is everywhere and always a monetary phenomenon. There is robust cross-country empirical evidence for this proposition, but it is also easy to imagine situations in which tests for the long-run neutrality of money might fail due to permanent shocks to financial technology that disturb the velocity term in the quantity theory equation. If these shocks are not modelled explicitly, then they could show up as a unit root process in the residual from a cointegrating specification involving money and inflation. Indeed, for an institution that prides itself on managing perceptions, as Ben Bernanke explained so persausively yesterday in his Senate testimony, it's odd that the central bank is blind to potential for conspiracy mischief that inevitably accompanies the killing of M3. Managing expectations about inflation, the designated successor to Greenspan said, is at the core of the Fed's job. A little bit of that sprinkled elsewhere in the central bank couldn't hurt. M3 does not appear to convey any additional information about economic activity that is not already embodied in M2. Academic papers have occasionally used M3 in empirical work, but these studies have not concluded that M3 is an important financial indicator. In addition, the role of M3 in the policy process has diminished greatly over time. M3 is not closely tracked by policy makers nor is it routinely analyzied by Federal Reserve System staff. Consequently, the costs of collecting the data and constructing and publishing M3 now appear to outweigh the benefits. Refco "Hiccup" a Symptom of Easy Money Binge Drinking? 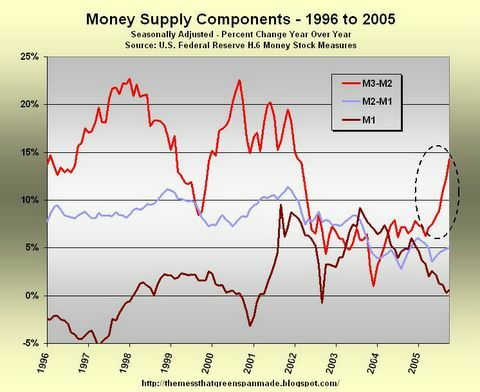 Taking a look at the most recent money supply data, I see that since August, M3 has been rising at a 12% annualized rate. Could this have something to do with a clandestine Fed bail out of...say...Fannie Mae, due to its derivative excesses? A little monetary "hair of the dog" after some derivative binge drinking? Could this be why the Fed is going to discontinue publishing figures for M3? Wouldn't want that to put the lie to their inflation fighting stance. 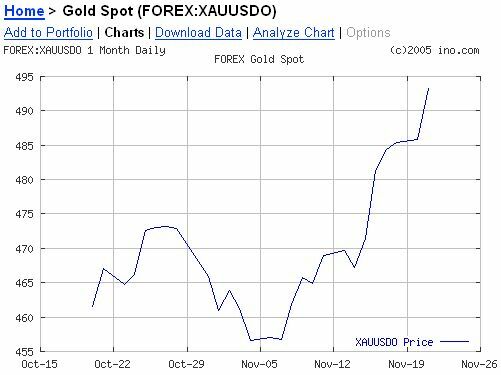 Could this be what precious metal markets are sniffing? Is M3 Disappearance a Problem? A Cover-up? I'll make a brief comment regarding the Fed’s decision to discontinue reporting M3. As someone who enjoys the convenience of using the M3 data on a weekly basis, I am disappointed. It made my analysis nice and too simple. Frankly, the monetary aggregates are losing their relevance. As a broad-based measurement of monetary instruments, M3 leaves a lot to be desired and has this year grossly under-represented actual monetary inflation. I have no confidence in the Fed’s compilation of banking system "net" repurchase agreement positions, and that it generally excludes Wall Street "repos" makes this number worthless. There are also issues with “eurodollar deposits.” Additionally, any broad measure of "money-like" instruments today must at the minimum include CP, some ABS and should include some "structured products." Increasingly, I've come to believe that M3 was seriously flawed and definitely an inadequate measurement of "broad money supply" and system liquidity. Better to just get rid of it. It will force us into better, more comprehensive analysis. Stark memo with no mainstream press trumpets, the Fed decided they are fed up feeding us vital financial information. So they will simply hide it from us so we can't see how much money they are creating out of thin air. Since conspiracy theories abound regarding the Fed's mysterious and rather sudden decision to discontinue collating the M3 data, we offer this – only partly tongue-in-cheek – as a further, suitably alarmist example of the genre. Firstly, we must ask whether it could be wholly a coincidence that, just as we are to read the obsequies over our beloved aggregate in March 2006, Iran (if not yet "wiped off the map" by the Imperial legions or their auxilia) is due to open its long-heralded oil bourse; an exchange where trading will be conducted – horror of horrors! – in Euros, not USD. The Fed Announces it will Hide M-3 to Keep You from Knowing What? It’s simple, really. So that the Plunge Protection Team can hide its market manipulative, equity buying activities. You see, one of the key differences between M-2 (which it appears they will report) and M-3, is repurchase agreements. This is perhaps the most obvious reporting item where PPT market buying transactions show up. If they no longer report this item, folks like us who monitor the growth of M-3 for clues as to when the PPT is likely to buy the market, will have a harder time reporting that fact before, or even as, the PPT buys. Investors will be left more in the dark as to any secret rigging of the stock market. Why now? Apparently the Federal Reserve (a key member of the Working Group, a.k.a. Plunge Protection Team) sees a coming need to buy — or facilitate the buying — of markets, including the equity market, incognito. Apparently, they don’t want investors knowing they are the ones doing the buying, keeping prices up, or pushing them higher. With M3 crossing the 10 trillion dollar level the Fed has decided to stop publication of this important data. The Fed by nature is an inflation machine built to support limitless spending by the government. Yet the Fed also enjoys the reputation of being an inflation fighter. In order to protect its image the Fed has found it necessary to cease publication of M3 data. Caroline Baum: Queen of the Sycophants. Perhaps she should spend less time pontificating in Manhattan boudoirs at tea time and put some effort into actually investigating the veracity of the "conspiracy theories". However, if she did that, she wouldn't be the flunky whose book gets published by her master, would she? Also, San Fran Fed president Yellen said in mid-October that she sees the neutral rate being as high as 5.5 percent. Interesting how that number jibes so well with your 5.3% CPI rate adjusted for housing price appreciation. she looks kind of cute in the picture next to her column at Bloomberg, but on the cover of her book you can't help but think about grabbing her hair, and ala Austin Powers, shouting "she's a man baby!" Has NO ONE reading these articles considered the fact that Iran is on schedule to open the Iranian Oil Bourse. This will be an exchange on which buyers of Petroleum will be able to do so in Euro's. No longer will a foriegn Country require large reserves of US DOllars to purchase Oil. With no need to hold dollars, central banks throughout Europe may choose to decrease their US Dollar Reserves, which means massive, simultaneous sell offs of US Assets for dollars to be converted to Euro's for Purchasing Oil. Euro or any other paper monopoly money.